Let’s just go ahead and say that Auburn University killed Osama bin Laden. Because not only did we recently learn that terrorism’s nightmare and Auburn alum Richard “Shark Man of the Delta” Marcinko founded the elite Navy SEAL team that took out the Al Qaeda leader, it now seems entirely possible that a dog possibly trained, at least in part, at Auburn University’s Canine Detection Training Center helped them do it. “Funny that you called, we were just talking about that,” said John Pearce, Associate Director of Auburn University’s Canine Detection Research Institute, speaking of Wednesday’s New York Times story that claims a bomb-sniffing dog accompanied the 80 American commandos that stormed bin Laden’s compound. Scientists at Auburn University’s College of Veterinary Medicine have genetically bred and specially trained canines to not only detect stationary bombs or bomb-making materials, but identify and alert their handler to the moving scent of explosive devices and materials left behind in the air, say, as a suicide bomber walked through a crowd — all without ever tipping off the perpetrator. 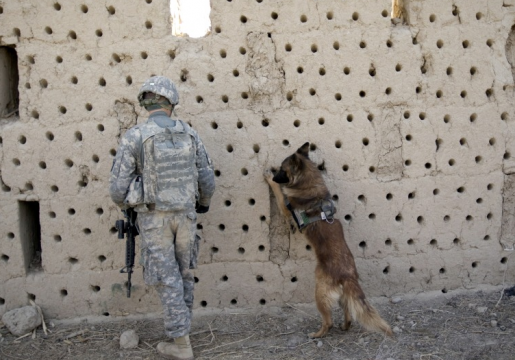 While not as expensive as some military-trained dogs, the cost of breeding and training these dogs cost is not cheap at around $20,000 each. According to the Washington Post, the dog used in the bin Laden operation was trained for combat environments at Lackland Air Force Base in Texas, but the New York Times story claims that the primary function of dogs used by Navy SEALS is finding explosives. Is it possible the dog received that part of it’s training in Auburn? Pearce says Auburn University’s Canine Detection Training Center currently has contracts with Federal Protective Services, private security companies, and “several other agencies,” some of which he was not at liberty to reveal. Pearce says that there are many training programs across the country similar to Auburn’s, which was recently featured on Fox News. But Auburn’s is the best, right? H/T Tamala Hillhouse and Keith Blackwood. I’m sure the New York Times would never give Auburn credit if the dog was trained here. The NYT also reports that the dog took an a few too many sociology independent study courses!